Up to and including Monday 22nd December, we'll be open as usual. On Tuesday 23rd December, we will be open until 17:00 hours and then we'll be closed for the holidays. We hope to ensure that the atrium will be available whilst the LRC is closed but as essential building work is scheduled for the 24th December to 5th January, there may be times when it is not. To avoid disappointment and unnecessary journeys in bad weather, please check by contacting the Security Team on 0131 474 0000. 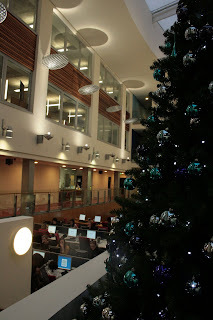 We'll be back at the LRC and open as usual on Monday 5th January.